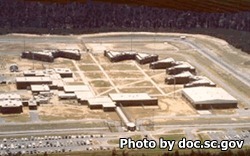 McCormick Correctional Institution is a level 3 maximum security prison located in McCormick South Carolina. The maximum capacity of this prison is 1,128 adult males. Inmates at McCormick Correctional Institution can be in the general population or in special management which is reserved for inmates who have become difficult to manage and are on disciplinary segregation, or who have safety and security concerns and are in protective custody. Offenders at this institution have primarily committed violent offenses, or have behavioral issues and have been transferred from another facility. Furthermore, inmates at McCormick Correctional Institution usually have long sentences. Offenders are closely supervised and are usually held in single or double bunked cells. McCormick Correctional Institution provides on site medical and dental services to all inmates. This facility participates in the correctional industries program and employs inmates in an upholstery shop, in powder coating metal products, and in a modular furniture plant. Offenders can take adult literacy courses, and earn a GED while incarcerated here, and have various religious worship services and substance abuse treatment programs provided to them. McCormick Correctional Institution uses a visitation schedule that rotates and is based on the first letter of the inmate's last name. Because of this you will need to contact the facility to see what the current rotation is and what day and time your inmate has visiting on. Visitation usually occurs on Saturdays and Sundays from 8am-12pm and from 1pm-5pm.